Northstar Entertainment today announced a pair of albums for the younger set (that parents might enjoy too) and a shopping mall tour that's headed to, among others, New York's Queens Center. I think everybody knows what Zhu Zhu pets are by now, the little hamsters were a ubiquitous item a few years back and appeared in toy stores everywhere. Though they've not been quite as popular since then, they're still a favorite of kids everywhere. An album featuring four of the guys (Mr Squiggles, Pipsqueak, Num Nums, and Chunk) is just about to hit retail and iTunes casting them as the Fab Four themselves- the Beatles. Children and grown-ups alike will want to sing along eight days a week as the Furry Four, Mr. Squiggles, Pipsqueak, Num Nums and Chunk, sing the songs from the Fab Four’s first LP Meet The Beatles. Tracks include “I Want To Hold Your Hand,” “I Saw Her Standing There,” “All My Loving,” “Little Child,” “Hold Me Tight,” and more. 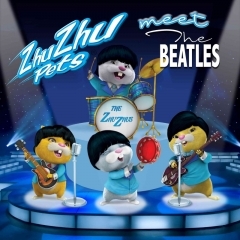 Look for ZhuZhu Pets meets the Beatles at retail for $12.98 this month. 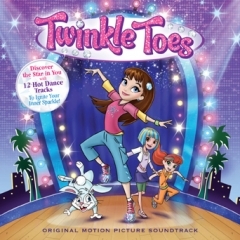 The second disc on the way is the soundtrack to the Twinkle Toes animated movie. This one features a selection of different tunes - all of which are of the 'get off the couch and dance' variety. The collection features expanded versions of songs from the movie plus three bonus tracks including new renditions of Christina Aguilera’s “Beautiful” and The Go-Gos’ “We Got The Beat,” as well as two extended dance mixes. Both the movie and soundtrack are inspired by Twinkle Toes, the best-selling SKECHERS girls’ shoes. Twinkle Toes will run the same as ZhuZhu- $12.98 and will also be available at the end of the month. **This event will take place between 10am and 2pm. The dance school performance, followed by free dance lesson, will take place specifically at 10am and 12 Noon. **All of the events below will take place between 12 Noon and 4pm. The dance school performance, followed by free dance lesson, will take place specifically at Noon and 2pm. So, just in case you missed it, the tour will indeed be coming to Queens Center Mall on Saturday August 4th. Festivities will start at noon and run through 4pm with a special dance school performance happening at both noontime and 2pm. Sweetening the deal a little further is that there will also be a pair of completely free dance lessons after both the 12 and 2 performances. Not too bad!